“Well do it on the monsters under your bed. That’ll solve two problems at once. I remember when I believed that. By the time I was 12, I had enough of a sence of logic to argue that point. Sometimes when you’re sick, you’re pefectly capable of going to school, but you should stay home so that you don’t spread the infection to others. 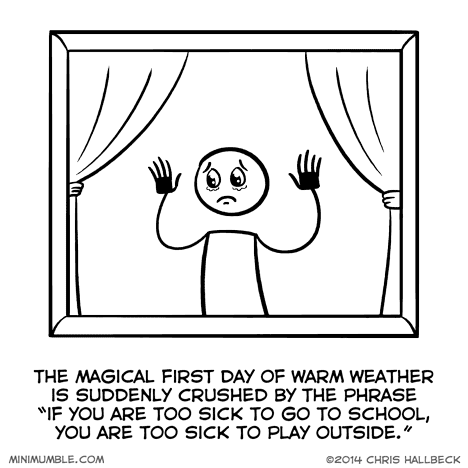 This is so especially true because, around here, the winter has been so long and difficult it has begun to drive people literally crazy. Yesterday was the first truly seriously nice day, and not only myself, but droves of other people, were outside just soaking it all in, going for walks and enjoying themselves. Around here, this is the time of year where warm and cold take turns daily to get us confused. Today, it’s clear, sunny, and you need a good jacket to ward of a heavy chill.